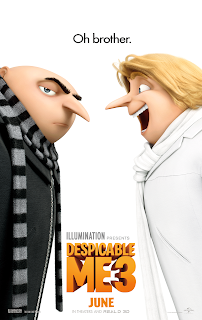 It's already been seven years since Illumination launched their careers with the much loved Despicable Me, a funny, unique animated blockbuster with a superb lead performance from Steve Carell. It's certainly clicked with audiences across the globe, particularly due to the beloved Minion sidekicks, leading to a even more successful sequel and a spinoff for the aforementioned Minions themselves. So, as was the obvious way forward, a threequel has arrived - it's success certainly doesn't rival the standards set by the series, though it thankfully doesn't detriment it further in any way. This time the focus is back on Gru (Steve Carell) and his retirement from evil and recruitment into the Anti-Villain League, living alongside wife Lucy Wilde (Kristen Wiig) and his three adoptive daughters. Their role in the AVL faces new challenges when rising supervillain Balthazar Bratt (Trey Parker) and his antics are on the rise, but Gru also faces his own personal dilemmas upon discovering his long lost twin brother, Dru (Carell), and further revelations of his past. From the get go it's apparent that Despicable Me 3 is as a colourfully animated as it's predecessors, and most of Illumination's efforts in general, maintaining it's loveable art style and becoming very expressive during it's most zany moments. This is bolstered further by some superb voicework from all those involved, particularly Carell as both Gru and Dru, and especially Trey Parker as entertaining albeit forgettable villain Balthazar Bratt; Parker's efforts can't help but feel wasted in the long run as whilst Bratt is always enjoyable to watch and contributes nicely to a lot of the overall humour, his random absences for large chunks of the film and relatively dull motives make him feel like a disappointing afterthought in hindsight. The story is certainly laid back and charming enough, and while it's sometimes content to recycle concepts and gags from the previous films, it's simplicity is something that'll help it appeal to a wide range of audiences. The same praise extends into the relationship between Gru and Dru; something kept simple but still appealing in many ways, even if Dru himself can too often shift into something annoying and obnoxious. Those are the words I feared I'd also be using to sum up the Minions, considering how their appeal seems to be milked grandly these days, though thankfully their role is kept to a solid minimum and their antics genuinely funny for the most part - making them fit in as nice comedic sidekicks and not insanely repetitive irritants. With all this in mind, Despicable Me 3 is a harmless and enjoyable family flick, even if it now already seems clear that the series really doesn't have the potential and depth to keep going for much longer.